My daughter and I are back home from our week-long road trip down to Alabama and after 7 days of eating fried foods and desserts every chance I got, plus downing daiquiris by the pool, some lighter meals are in order. I’m not even going to step on the scale for at least a week, because I just might cry. 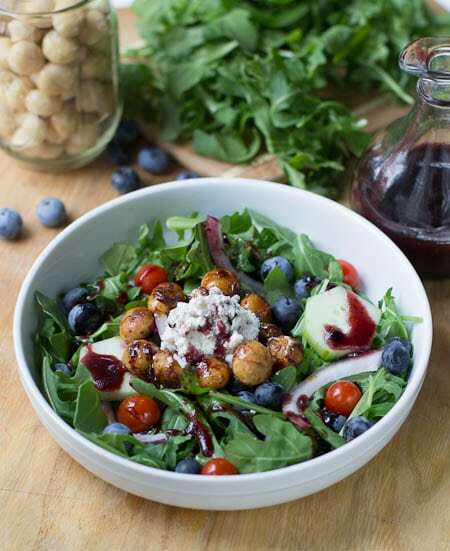 Arugula Salad with Blueberry Balsamic Vinaigrette and Honey-Roasted Macadamia Nuts is a light and summery salad that’s anything but light on flavor. The salad dressing takes several days to make, but it’s worth the wait. It produces a thick, syrupy dressing that’s a nice contrast to tangy goat cheese and peppery arugula. 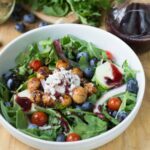 This could actually be called triple blueberry salad because there are blueberries in the vinaigrette, fresh blueberries in the salad, plus I used a wonderful blueberry goat cheese. Yes, I love blueberries! The blueberry goat cheese is a wonderful local product made by Round Mountain Creamery in Black Mountain, NC. There has really been an explosion of farms in that area producing their own cheeses. They sell a bunch of flavored goat cheeses, but this one with blueberries, pecans, and lemons is phenomenal in salads, on sandwiches, crackers, or smeared on a toasted bagel. You can order their cheeses online. With the crunch of some spicy/sweet macadamia nuts, this salad will get you out of your ordinary salad rut. Add some grilled chicken or shrimp and call it a meal. Make the Vinaigrette. First make a blueberry flavored vinegar. In a small saucepan, crush the blueberries with a fork or potato masher. Add vinegar, sugar, lime peel, and cinnamon stick and bring to a boil. Reduce heat to low, cover and simmer for 20 minutes. Remove from heat and discard cinnamon stick. Let mixture cool and place in refrigerator for 24 hours. Strain the mixture into a bowl, using a fine-mesh strainer. Use a wooden spoon to press as much liquid out as possible. Discard solids. 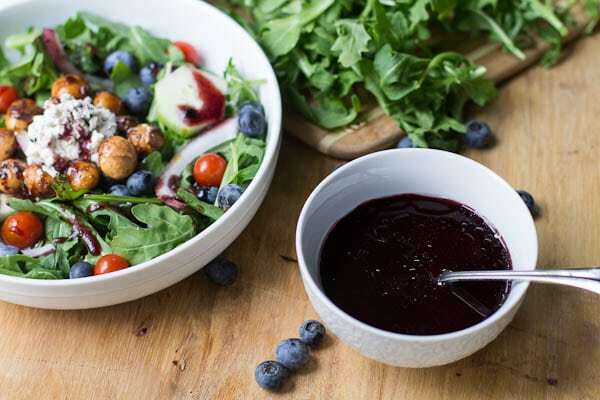 In a small bowl combine 3 tablespoons of the blueberry vinegar, salt, and pepper to taste. Gradually whisk in olive oil. Make Macadamia Nuts. Preheat oven to 350°. Combine arugula, cucumber, red onion, tomatoes, and blueberries in a large salad bowl. Top with goat cheese and macadamia nuts. Drizzle with vinaigrette. 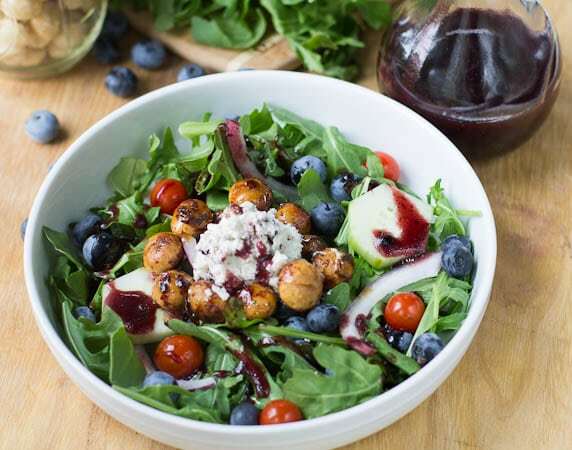 This entry was posted in Salads and tagged blueberries, macadamia nuts, salad, vinaigrette. Bookmark the permalink. OMG. Everything about this salad. Literally, every single component. This has got to be one of my favorite things you’ve posted! What a gorgeous salad and a fantastic vacation. What I would give to take either of my kids away-ll; to myself. And then we could eat this salad –Oh, just dreaming, but it all sounds so good! Thanks for visiting my site. Can’t wait to see more of yours! I saw this on Food Gawker and I love both the pictures and recipes – pinned! i love nuts and adore blueberries. This salad is spot on! Can’t wait to try it! Pinning! I would absolutely love this salad! The vinaigrette sounds divine!